This is the second KC album I purchased, after getting Beat (1982). It was King Crimson’s first album following a seven-year hiatus. Right away it is clear that this is a unique album. There is a distinctly eastern feel to the music. And it came at a time when Fripp was starting his guitar lessons and devising his alternative guitar tunings. Tony Levin kicks off the album, with a crazy chapman stick riff in “Elephant Talk”, a perfect opener if there ever was one. Tony and Robert’s parts collide with each other into one powerful force, accumulating into great chemistry between them. Adrian Belew’s vocals and rhythm guitar lines add a sense of spontaneity to the band. While the other members are primarily musicians, he’s definitely a bit of a showman and personality. Adrian’s yelps of, “Talk, its only talk. Babble, burble, banter, bicker bicker bicker. Brouhaha, boulderdash, ballyhoo. Its only talk…” introduces a sense of eccentricity that is fields away from the serious nature of middle-70s King Crimson. “Frame By Frame” continues the story of “Elephant Talk”. The lyrics don’t seem to have any specific meaning, but there is a chance that they are completely interpretational due to their broad nature. “Matte Kudasai”, is s brooding chilled-out lullaby. It features some of Adrian’s best vocals on the album and contains a seagull effect that can be seen on the live DVD performance. “Thela Hun Ginjeet” (an anagram for “Heat in the Jungle”). It’s funky, spaced out and weirdly fun, but still has a strict King Crimson personality. Robert Fripp plays his guitar in 7/8 time while everything else plays in 4/4, eventually coming into syncopation with each other later. While the track was being recorded for the Discipline album, Adrian Belew, walking around Notting Hill Gate in London with a tape recorder looking for inspiration, was harassed first by a gang and then by the police. On returning to the studio, he gave a distraught account to his band-mates of what had just happened to him. This account was recorded by Fripp without Belew’s knowledge. “The Sheltering Sky” shows Fripp and Belew feeding off each other perfectly. Robert Fripp’s Frippertronics system is in full effect. The track is named after and partially inspired by the 1949 novel of the same name by Paul Bowles. Bowles is often associated with the Beat generation, which would be an inspiration for ‘Beat’. “Discipline” is the highlight of the album, in intricate intertwining of repeating odd time-signatures between two of the most thought-provoking guitarists ever and creates a flawless statement in minimalism. King Crimson made a vital progression with this album, instead of keeping with the same sound like so many of their progressive rock contemporaries. 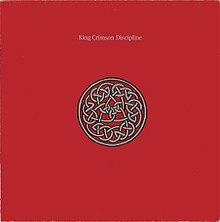 Robert Fripp’s guitar lines have never been so refreshing while Tony Levin’s chapstick device and Bill Bruford’s expansive drum sound added another layer to King Crimson’s ever growing domain. Red may be more influential and sentimental, but Discipline manages to better it in a lot of different ways. It’s sad that ‘In The Court of the Crimson King’ might be considered their best, because in reality, Discipline and Red betters it out by a wide margin.